If you've ever watched the British TV Game Show "The Weakest Link" (or one of its numerous international spinoffs) you've probably learned some of the most important lessons of strategy implementation. First, a quick overview of the rules. The contestants are asked questions one at a time. Each time a contestant gets a question right, an amount of money is added to the prize pot. The objective is to chain as many correct answers together in a sequence as possible. Each correct answer in a chain of correct answers is worth more than the one before it. The chain is broken when a contestant gets a question wrong or says "bank" just before their turn. If the chain is broken because a contestant gets a question wrong, then the money in the pot is lost. If the chain is broken because a contestant says "bank" then the pot is added to the prize purse and cannot subsequently be lost. In either case, the value which can be won be answering the next question correctly is set back to the initial amount and must be gradually built up again. It follows from this that the most amount of money that can be won in a round is won by answering all the questions correctly and never saying "bank". However, if the contestant answers just the very last question incorrectly, then the whole group gets nothing for the round even if they'd answered all the other questions correctly. The reward and risk are maximised by following this strategy. Alternatively, if each contestant says "bank" before every question, then the purse will be increased for each correct answer, but the amount by which it is increased will never increase, limiting the total amount that can be won. The key to success in "The Weakest Link" is to bank at the right times. Don't bank often enough and the risk becomes to high; bank too often, and the reward are limited. It is the same in strategy execution. Lesson 1: Bank often to reduce risk. In strategy execution, banking means delivering a change into an operating business. Documents, plans, blue prints, strategies are all well and fine, but they are not bankable until the are effected as changes to the operation. Similarly, programme code is fine, but it is not banked until it is launched into production. Strategies are worthless until they are executed. All of these things can be likened to work-in-progress (WIP) in manufacturing terms: although WIP is treated as an asset on the balance sheet in accounting terms, in financial terms, they remain costs until the work is completed and the product is sold. Just as firms should reduce work in progress, so to should they aim to reduce plans not yet executed to completion. The way to achieve this is to break big changes into smaller changes. This is not the same as breaking projects into phases, such as analysis, design, implementation and testing. This means breaking changes into smaller changes which can be implemented and each of which improve the operating business. Lesson 2: Banking too often reduces returns. It is a fine balancing act. If you change too often the organisation will start to suffer from change fatigue, and the operation will never become stable enough as a platform for future changes. For example, where change is implemented through computer systems, each change needs to be fully testing, data needs to be converted and operating procedures need to be changed. All of this costs money and so cannot be undertaken too often. Every operation requires a natural rhythm of change. If change is infrequent and irregular it will be hard to analyse and control. 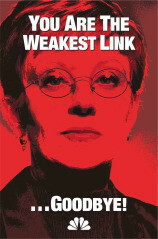 However, unlike in "The Weakest Link", the rules are not cast in stone. Once you have established a natural rhythm, you should aim to speed it up, achieving higher rewards at lower levels of risk.